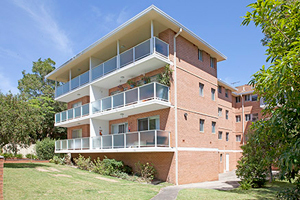 Owners of the Caringbah strata building had become aware of how unsafe their existing balustrades were when a new owner felt there was an issue and had that confirmed when they spoke to the property’s handyman. The sides of the single-block balcony walls on each of the 21 units were not joined to the wall of the building creating a very serious safety hazard. So rather than continue doing a patch job, the strata committee obtained an engineer’s assessment, subsequently deciding to replace the balcony walls. Even though the job had been put out to tender, the committee specifically sought a quote form Buildcore Constructions on the recommendations of a strata member who had been impressed with the company’s work as a former client. Buildcore won the bid. What made them stand out was Mark’s level of detail in his quote, his willingness to provide an economical outcome around the client’s needs and his open communication with owners. By listening to client needs and creating a clever design, Buildcore Constructions transformed the 40-year-old residential block into a modern looking property. Gone are unsafe brick balcony walls. They were replaced with contemporary glass and aluminium balustrades. The owners and tenants couldn’t be happier. The remedial work also included grading roof support and redesigning drainage. “We don’t just work for our clients. We Work with them,” Mark said. Jackie keenly admits working with Mark was a breeze and the owners and tenants alike appreciated his consistent communication and progress updates. Mark explained fully the process, held weekly on-site meetings with strata representatives and managed the project with minimum disruption to the lifestyle and daily movements of tenants. One such delay was the discovery of asbestos concrete edging on all of the balconies. Buildcore moved quickly to rework the job program and remove the asbestos safely while scaffolding was still in place. By taking a sensible yet legal management approach, Mark value added to the job with the asbestos removal while maintaining the project timeline. Tenants were thankful for his efforts, which allowed them to continue their daily lives with minimal disruption. “The work was always friendly, helpful and clean on site,” Jackie said. Mark said even phone calls came into his office saying how safe and obliging the workers were. That doesn’t happen often in the building industry.